VLN Partners, LLP is a research-based K-12 education services provider that has developed a revolutionary model for technology-enhanced instruction called the holistic model for blended learning. We are a quality driven service and consulting organization that works with school districts to help them embrace 21st century learning. What we do that sets us apart from any other company today is we form working partnerships with public school districts (K-12) to help them compete with cyber charter schools and other external education providers. 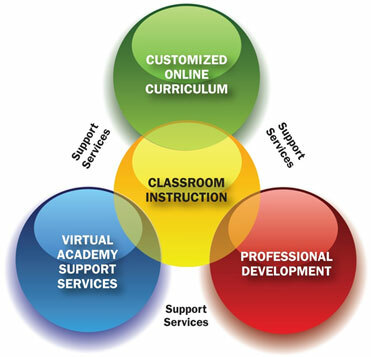 We currently operate one of the largest networks of district-based virtual academies in the country and our mission is to continue to build a nation-wide network of quality-focused, service oriented district-level virtual schools that take advantage of our products and support services to meet the educational needs of students in a variety of learning environments. Our team of educational consultants and expert course developers work with district staff to establish working virtual academies that use courses from our high quality, standards-based VLN Essentials course catalog, or for an additional fee, our team creates a highly customized online curriculum that matches both the scope and the sequence of instruction presented in your district’s bricks and mortar classrooms. The lessons are delivered via the World Wide Web so students can access them from anywhere at any time.